The hopes of Ztumsians looking for and end to the drugs wars that have ravaged the country's eastern provinces were dashed this week as ZITs and PISSOF troops rallied in Kisangi after being thrown out of neighbouring Nanaan Province by the religious fundamentalists of the Zits Old Guard or ZOGs (see last issue of Ztum-Setum Online News). 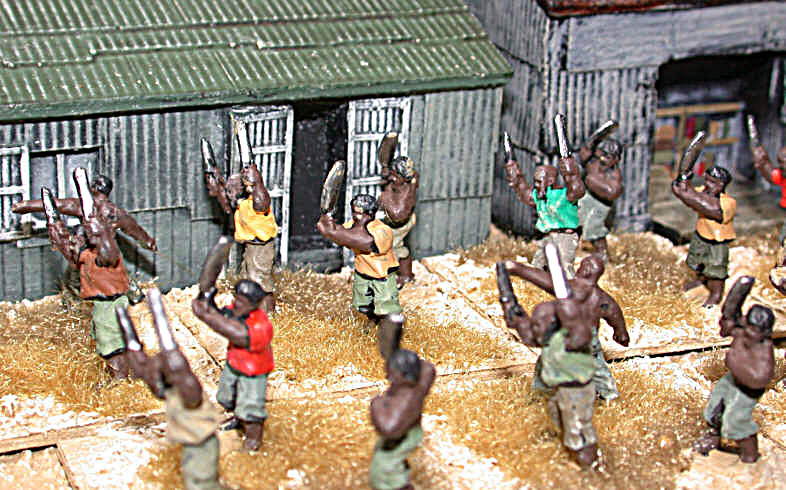 Brutally supressing rioting by civilians, a major factor in their defeat in Nanaan, the ZITs and PISSOF armies, who just last week looked as though they were finished as major players in the Ztum-Setum wars, have rallied and taken up defensive positions along the Nanaan - Kisangi border. Senior officers are working hard to make good the losses in men and materiel sustained during the battle for Nanaan. The ZOGs army has ceased its pursuit and has started to consolidate its hold on Nannan Province. It is noticeable that the Ghost Warriors are being kept well out of cities and towns in an attempt to stop trouble breaking out between the religiously fanatical hillmen and the more worldly urban residents. Armed mobs, such as this one pictured last month, have now disappeared from the streets of Nanaan City as ZOGs' troops consolidate their control. Rioting mobs were instrumental in the ZITs and PISSOF defeat in Nannaan, tying up considerable numbers of troops in security duties. Petramco's Chief Executive Officer for Africa has been fired along with his Head of Security and the PISSOF officer corps has been purged for the third time this year. Rumours abound that a trusted member of the ZITs' Inner Council attempted to assassinate Heviosso, C in C of the ZITs, with a briefcase bomb last week - though he was seen in public yesterday looking healthy and uninjured and official ZITS sources deny that any attempt has been made on his life.